Half Orcs are a tribal, often nomadic people native to several regions of Nora. Their tradition traces back their ancestry to a time when animals talked and the mighty boar learned to walk on its hind legs and became kona. They soon became enslaved workers of the shi-imti-civilization, but have, since its fall, developed a unique and advanced culture of their own. As a traveling race, Half Orcs have spread across Nora and each pocket population has sprouted their own unique traditions and beliefs. The most well known are the Kona of eastern Vatharond, but there is also the Herskeri of Ibben, the Vandari of Levetiera, and the Cenizo of Salvatore. They commonly take up the mantle of traders or entertainers making use of their traveling make a living. The kona have a very tight and somewhat closed community and have often lived apart from the rest of society. Because of their nomadic lifestyle and differences in language and culture, there has been a great deal of mutual distrust between kona and their more settled neighbors. 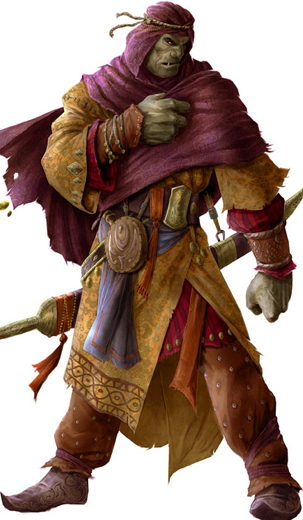 The popular image of a half orc as a simple thief and thug, unfit for work contributed to their widespread persecution as well as the mistaken belief that the race is descended from orcs. While there is no reliable count of kona numbers, they are found in most regions. By their very nature, they wish to stay apart from society and keep their secrets safe. Because of their widespread population, there is a number of subgroups that have come about. Each subgroup is then further divided into tribes or clans (these terms are used interchangeably). The eastern half orcs are much more reclusive then other kona subgroups. They live in small communities and live off the land instead of trading or interacting with larger settlements. They are larger then other kona and have a much darker complexion. They are often reputed to be temperamental and dim-witted, but they also are considered to be incredible hunters with noses as sensitive as bloodhounds. While the former is mostly due to prejudice, the later has proven true to the point where if someone is hunting for a difficult quarry, they inevitably seek out the kona. Several tribes can be found in eastern Vatharond. Found in camps about the Cinderlands. They wield massive hammers and often decorate themselves with the skulls of the strange animals found in those dry highlands. Three clans make their home in this hostile area, the Sun Clan (Solen-klannen), the Dream Clan (Drøm-klannen) and the Skull Clan (Skallen-klannen). These kona, also called as the town-orcs, live in large cities (a notable population is found in Alexandria), most often in squalid ghettos gaining employment as laborers and hired muscle. Kona culture is based on community and extended family. Tradition ensures the culture remains largely homogeneous even in groups that have had no contact with each other for generations. Kona most visible to the settled community are those that for various reasons, including traditional avoidance of "pollution" by close contact with non-Kona (cultural standards of cleanliness states that non-Kona are spiritually unclean, and are therefore avoided for purity reasons as well as fear of persecution), still live in shacks and beg on the streets, perpetuating the bad image of Kona overall. Society is predominately patriarchal with women having few rights. Gender roles are highly traditional where men are expected to act with their hands and strength, while women use their cunning. For example, pick pocketing and cat burglary is considered highly feminine as it uses intuition and speed over power. Virginity is essential in unmarried women. Both men and women often marry young, sometimes even before maturity. The groom's family must pay a dowry to the bride's family to "buy" the bride, however it is common practice to simply kidnap the bride instead. Kona social behavior is strictly regulated by purity laws. This regulation affects many aspects of life and is applied to actions, people, and things. The lower body is considered impure. Clothes for the lower body, as well as the clothes of menstruating women, are washed separately. Items used for eating are also washed in a different place. Childbirth is considered impure and must occur outside the dwelling place; the mother is considered impure for 40 days. Death is seen as impure and affects the whole family of the dead, who may remain impure for a period; also, usually private items of the dead are considered to be impure and are to be buried in the grave or given to non-Kona poor people. Kona dead must be buried, not burned. It is believed the soul of the dead does not officially enter the after-life until after the burial. It is customary to translate this word as "the scent", to describe the smell and demeanor of someone fully integrated into Kona society. Parfymen is Kona essence, and willingness to follow the Kona Code, self-perception as a member of the society and willingness to be such a member, set of "Kona" strains etc, all as part of the whole. Sometimes a member of another race who has parfymen is considered to be Kona (an adopted non-Kona child who has grown up in a Kona family). A Kona who does not have parfymen is not considered a Kona.